The Germantown, NY area has had 6 reports of on-the-ground hail by trained spotters, and has been under severe weather warnings 19 times during the past 12 months. 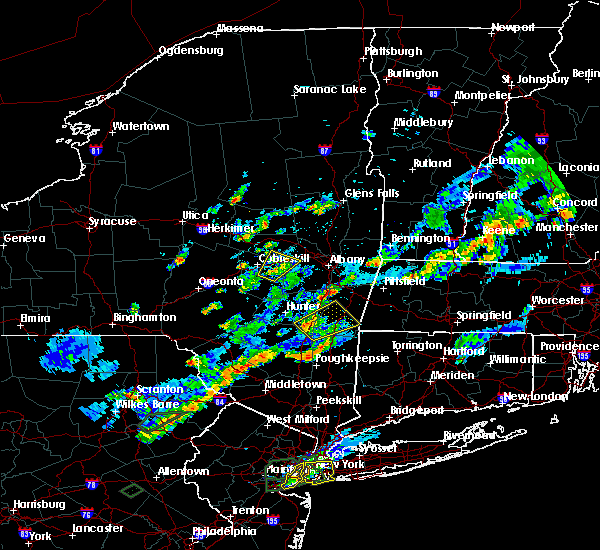 Doppler radar has detected hail at or near Germantown, NY on 17 occasions, including 1 occasion during the past year. 8/3/2018 4:27 PM EDT At 427 pm edt, a severe thunderstorm was located over red hook, or near rhinebeck, moving north at 40 mph (radar indicated). Hazards include 60 mph wind gusts and quarter size hail. Hail damage to vehicles is expected. expect wind damage to roofs, siding, and trees. this severe thunderstorm will be near, clermont around 435 pm edt. livingston around 440 pm edt. 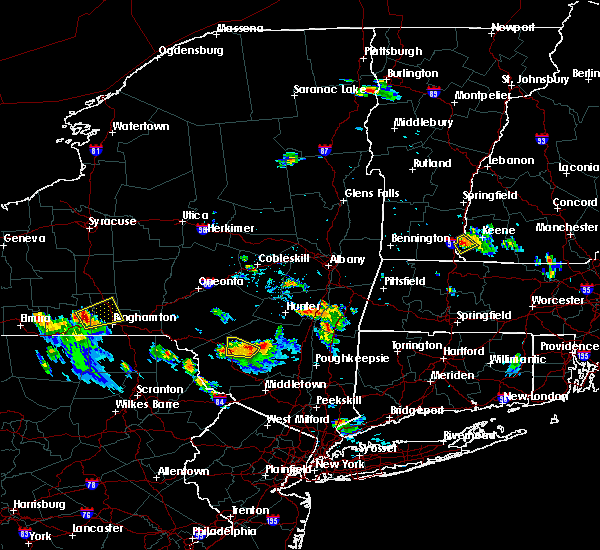 catskill, claverack and claverack-red mills around 450 pm edt. hudson, athens and lorenz park around 455 pm edt. coxsackie around 505 pm edt. 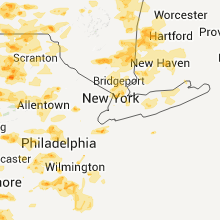 new baltimore, valatie and kinderhook around 510 pm edt. Other locations impacted by this severe thunderstorm include ancramdale, burden, rossman, rayville, otter hook, riders mills, north hillsdale, kiskatom, climax and brick tavern. 7/27/2018 5:13 PM EDT At 513 pm edt, a severe thunderstorm was located over saugerties south, or over saugerties, moving northeast at 30 mph (radar indicated). Hazards include 60 mph wind gusts and quarter size hail. Hail damage to vehicles is expected. expect wind damage to roofs, siding, and trees. this severe storm will be near, red hook around 520 pm edt. clermont around 530 pm edt. catskill around 535 pm edt. livingston around 540 pm edt. hudson, claverack, philmont and claverack-red mills around 545 pm edt. Other locations impacted by this severe thunderstorm include kerleys corners, quarryville, burden dock, manorville, katsbaan, burden, churchtown, linden acres, linlithgo mills and kiskatom. 7/27/2018 4:49 PM EDT At 449 pm edt, a severe thunderstorm was located over kenneth l wilson campground, or 10 miles west of kingston, moving northeast at 30 mph (radar indicated). Hazards include 60 mph wind gusts and quarter size hail. Hail damage to vehicles is expected. expect wind damage to roofs, siding, and trees. this severe thunderstorm will be near, west hurley around 455 pm edt. hurley and woodstock around 500 pm edt. kingston and lake katrine around 510 pm edt. 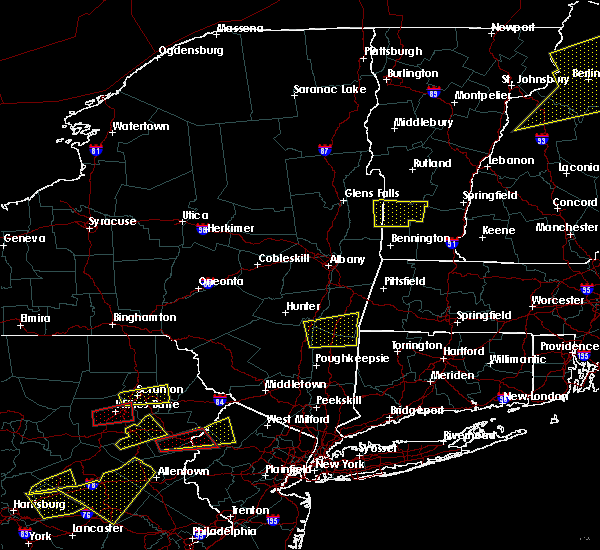 saugerties, red hook and saugerties south around 520 pm edt. clermont around 530 pm edt. catskill and livingston around 540 pm edt. hudson, claverack, philmont and claverack-red mills around 545 pm edt. Other locations impacted by this severe thunderstorm include rolling meadows, kerleys corners, glenford, atwood, manorville, katsbaan, shultis corners, sweet meadows, pacama and brodhead. 5/15/2018 3:17 PM EDT At 316 pm edt, a severe thunderstorm was located over ancram, or 13 miles southeast of hudson, moving east at 50 mph (radar indicated). Hazards include two inch hail and 60 mph wind gusts. People and animals outdoors will be injured. expect hail damage to roofs, siding, windows, and vehicles. expect wind damage to roofs, siding, and trees. this severe storm will be near, copake around 325 pm edt. 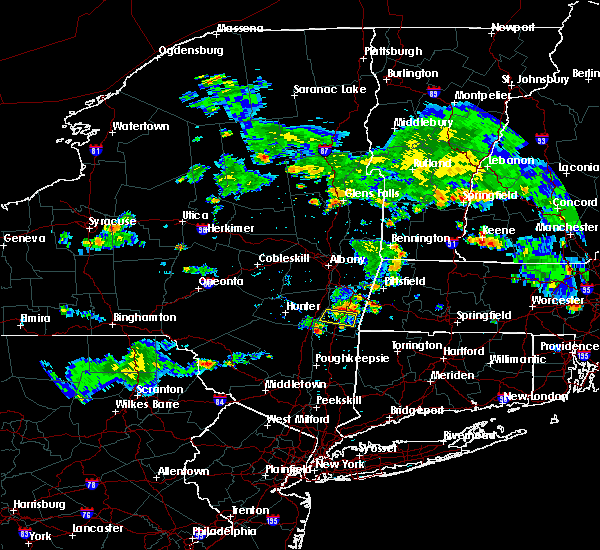 great barrington, sheffield, canaan and ashley falls around 340 pm edt. sandisfield around 350 pm edt. otis around 355 pm edt. tolland around 400 pm edt. other locations impacted by this severe thunderstorm include ancramdale, kerleys corners, manorville, katsbaan, shultis corners, sweet meadows, burden, linden acres, glendale and salisbury. 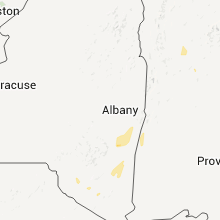 A tornado watch remains in effect until 800 pm edt for northern connecticut, western massachusetts, and east central new york. 5/15/2018 2:58 PM EDT At 257 pm edt, a severe thunderstorm was located over saugerties south, or over saugerties, moving east at 50 mph (radar indicated). Hazards include ping pong ball size hail. People and animals outdoors will be injured. expect damage to roofs, siding, windows, and vehicles. this severe thunderstorm will be near, livingston and clermont around 310 pm edt. 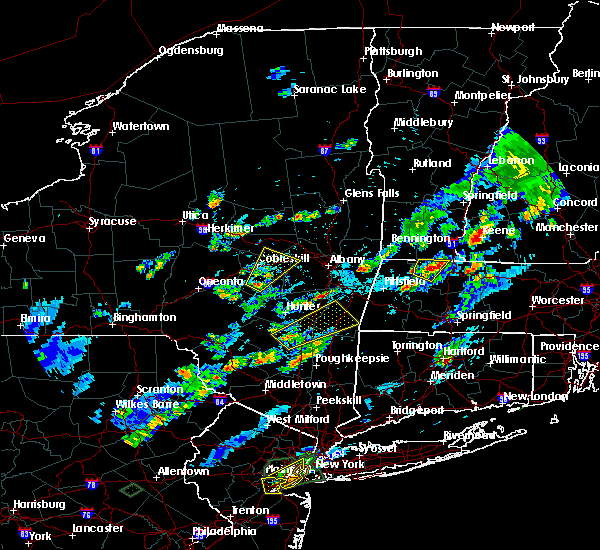 pine plains and ancram around 320 pm edt. copake around 325 pm edt. 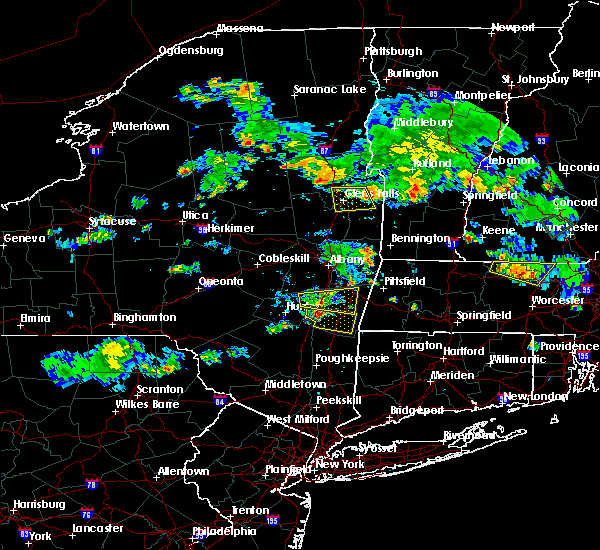 great barrington, sheffield, canaan and ashley falls around 340 pm edt. sandisfield around 350 pm edt. otis around 355 pm edt. tolland around 400 pm edt. other locations impacted by this severe thunderstorm include ancramdale, kerleys corners, manorville, katsbaan, shultis corners, sweet meadows, burden, linden acres, glendale and salisbury. 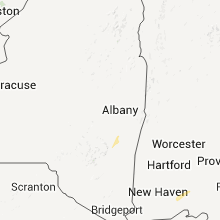 A tornado watch remains in effect until 800 pm edt for northern connecticut, western massachusetts, and east central new york. 5/15/2018 2:49 PM EDT At 244 pm edt, a severe thunderstorm capable of producing a tornado was located over clermont, or near saugerties, moving east at 40 mph (radar indicated rotation). Hazards include tornado and two inch hail. Flying debris will be dangerous to those caught without shelter. mobile homes will be damaged or destroyed. damage to roofs, windows, and vehicles will occur. tree damage is likely. This dangerous storm will be near, ancram around 300 pm edt. 5/15/2018 2:45 PM EDT At 244 pm edt, a severe thunderstorm capable of producing a tornado was located over clermont, or near saugerties, moving east at 40 mph (radar indicated rotation). Hazards include tornado and two inch hail. Flying debris will be dangerous to those caught without shelter. mobile homes will be damaged or destroyed. damage to roofs, windows, and vehicles will occur. tree damage is likely. This dangerous storm will be near, ancram around 300 pm edt. 5/15/2018 2:31 PM EDT At 230 pm edt, a severe thunderstorm capable of producing a tornado was located over saugerties south, or near saugerties, moving east at 45 mph (radar indicated rotation). Hazards include tornado and golf ball size hail. Flying debris will be dangerous to those caught without shelter. mobile homes will be damaged or destroyed. damage to roofs, windows, and vehicles will occur. tree damage is likely. this dangerous storm will be near, livingston and clermont around 245 pm edt. Ancram around 255 pm edt. 5/15/2018 2:13 PM EDT At 212 pm edt, a severe thunderstorm was located near lanesville, or near hunter, moving east at 40 mph (radar indicated). Hazards include ping pong ball size hail and 60 mph wind gusts. People and animals outdoors will be injured. expect hail damage to roofs, siding, windows, and vehicles. expect wind damage to roofs, siding, and trees. this severe storm will be near, north-south lake campground around 225 pm edt. 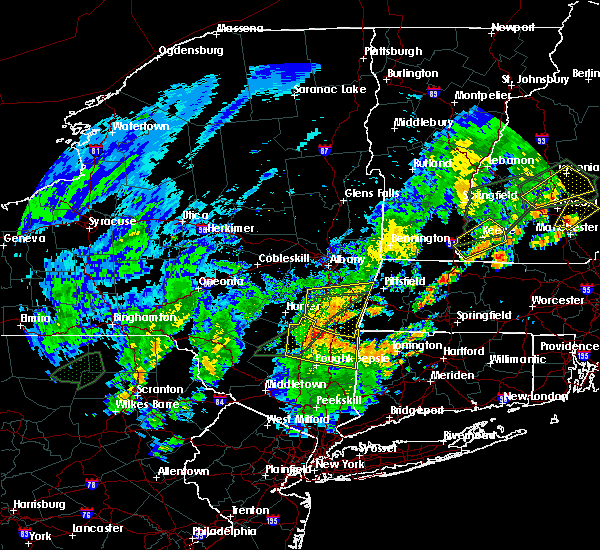 saugerties and saugerties south around 230 pm edt. catskill and clermont around 240 pm edt. hudson, claverack, livingston and claverack-red mills around 245 pm edt. A tornado watch remains in effect until 800 pm edt for east central new york. 5/15/2018 1:55 PM EDT At 155 pm edt, a severe thunderstorm was located near phoenicia, or 11 miles southwest of hunter, moving east at 55 mph (radar indicated). Hazards include 60 mph wind gusts and quarter size hail. Hail damage to vehicles is expected. expect wind damage to roofs, siding, and trees. this severe thunderstorm will be near, lanesville and mount tremper around 200 pm edt. hunter around 205 pm edt. woodstock around 210 pm edt. saugerties and north-south lake campground around 215 pm edt. saugerties south around 220 pm edt. catskill and clermont around 225 pm edt. hudson, claverack, livingston, athens, claverack-red mills and lorenz park around 230 pm edt. philmont around 235 pm edt. A tornado watch remains in effect until 800 pm edt for east central new york. 5/4/2018 5:03 PM EDT At 501 pm edt, a severe thunderstorm was located near livingston, or near catskill, moving northeast at 60 mph (radar indicated). Hazards include 60 mph wind gusts and penny size hail. Expect damage to trees and power lines. this severe thunderstorm will be near, hudson around 505 pm edt. claverack, athens, claverack-red mills and lorenz park around 510 pm edt. philmont around 515 pm edt. chatham around 520 pm edt. austerlitz and housatonic around 525 pm edt. new lebanon around 530 pm edt. lee and lenox around 535 pm edt. pittsfield around 540 pm edt. Other locations impacted by this severe thunderstorm include cheshire harbor, burden, glendale, north hillsdale, brick tavern, lenox dale, harlemville, the center at lenox, dalton and adams junction. 9/11/2016 7:53 AM EDT At 752 am edt, severe thunderstorms were located along a line extending from near nassau to near philmont to near stanfordville, moving east at 35 mph (radar indicated). Hazards include 60 mph wind gusts. Expect damage to roofs. siding. and trees. 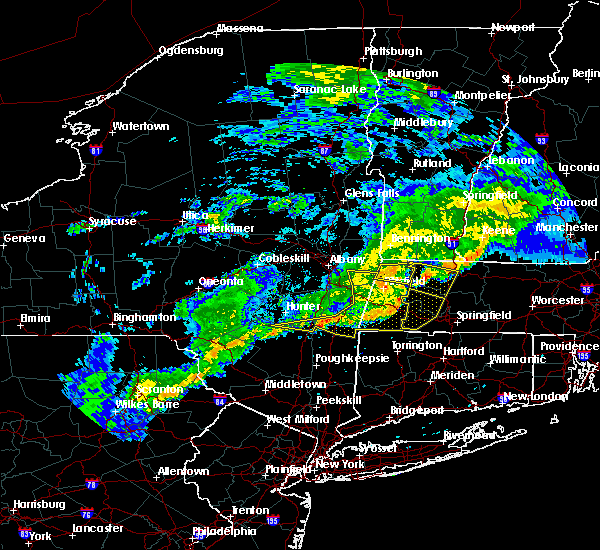 these severe storms will be near, copake around 800 am edt. 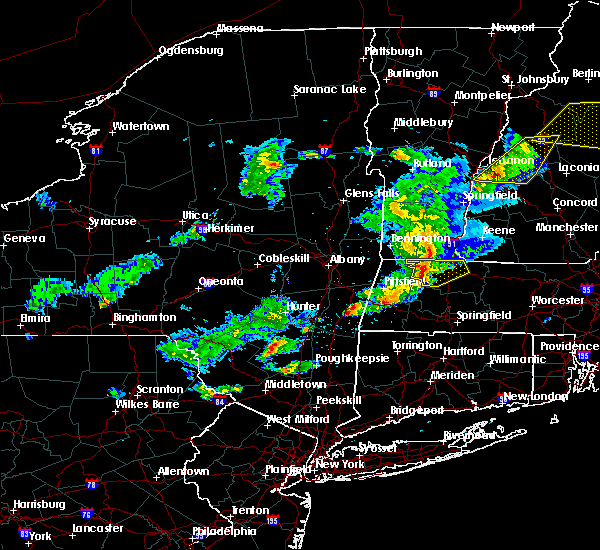 great barrington, new lebanon and housatonic around 810 am edt. sheffield around 820 am edt. pittsfield and lenox around 825 am edt. lee around 830 am edt. Other locations impacted by these severe thunderstorms include east chatham, riders, elizaville, lenox house country shops, braeside, berkshire heights, lanesborough, new lebanon center, copake falls and east hillsdale. 9/11/2016 7:26 AM EDT At 726 am edt, severe thunderstorms were located along a line extending from near selkirk to near athens to lake katrine, moving east at 35 mph (radar indicated). Hazards include 60 mph wind gusts. Expect damage to roofs. siding. and trees. severe thunderstorms will be near, athens around 730 am edt. 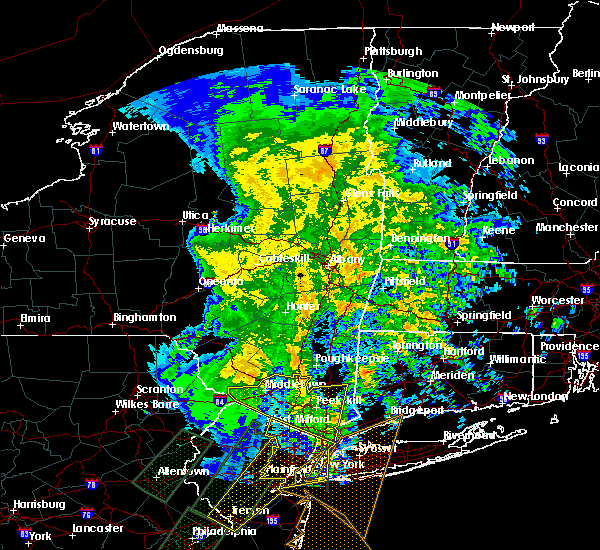 east greenbush, hudson, red hook and lorenz park around 735 am edt. 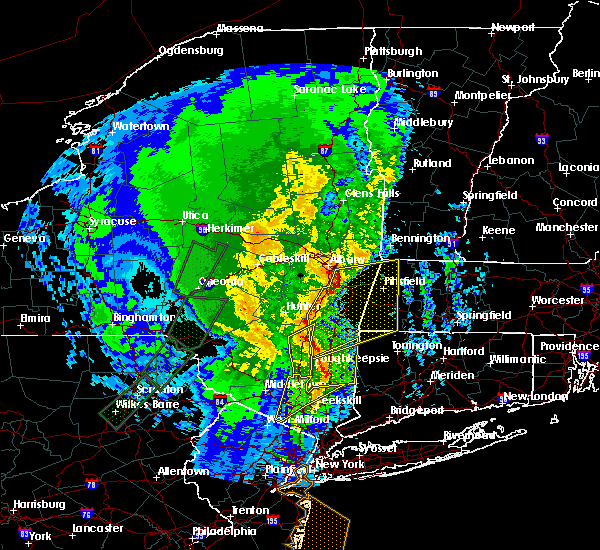 claverack and claverack-red mills around 740 am edt. nassau, valatie, philmont and kinderhook around 745 am edt. pine plains around 755 am edt. copake and stephentown around 800 am edt. 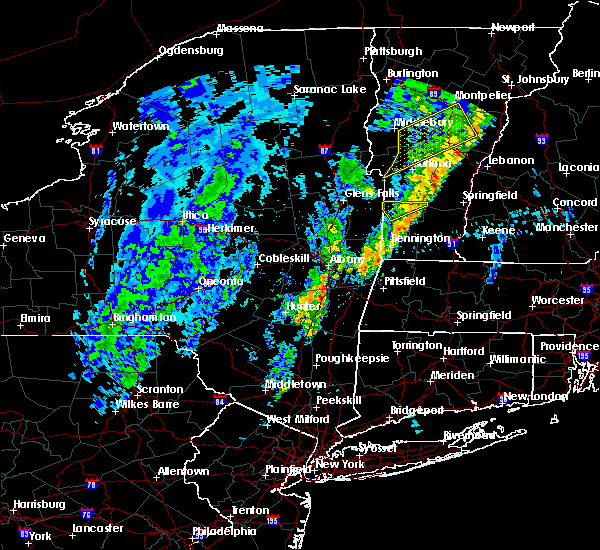 great barrington, new lebanon and housatonic around 810 am edt. lenox and sheffield around 820 am edt. Other locations impacted by these severe thunderstorms include cheviot, elizaville, lenox house country shops, fitchs wharf, dunham hollow, mount ross, mellenville, callanans corners, mahkeenac heights and ancramdale. 8/15/2015 6:21 PM EDT The severe thunderstorm warning for southwestern columbia county will expire at 630 pm edt, the storm which prompted the warning has weakened below severe limits and exited the warned area. therefore the warning will be allowed to expire. 8/15/2015 6:02 PM EDT At 602 pm edt, a severe thunderstorm was located near claverack, or near hudson, moving east at 20 mph (radar indicated). Hazards include 60 mph wind gusts and quarter size hail. Hail damage to vehicles is expected. expect wind damage to roofs, siding and trees. this severe storm will be near, copake around 625 pm edt. Other locations impacted by this severe thunderstorm include hollowville, west taghkanic, craryville, linlithgo mills, new forge, hillsdale, east taghkanic, linlithgo, churchtown and upper hollowville. 8/15/2015 5:39 PM EDT At 539 pm edt, a severe thunderstorm was located over catskill, moving east at 20 mph (radar indicated). Hazards include 60 mph wind gusts and quarter size hail. Hail damage to vehicles is expected. expect wind damage to roofs, siding and trees. this severe thunderstorm will be near, clermont and athens around 545 pm edt. hudson around 550 pm edt. livingston and claverack-red mills around 555 pm edt. claverack around 600 pm edt. copake around 625 pm edt. Other locations impacted by this severe thunderstorm include cauterskill, hollowville, smith landing, cheviot, oak hill landing, new forge, alsen, kiskatom, east taghkanic and martindale. 7/26/2015 4:35 PM EDT At 435 pm edt, a severe thunderstorm was located over clermont, or 8 miles east of saugerties, moving east at 10 mph (radar indicated). Hazards include 60 mph wind gusts and quarter size hail. Hail damage to vehicles is expected. expect wind damage to roofs, siding and trees. this severe thunderstorm will be near, livingston around 445 pm edt. pine plains around 455 pm edt. ancram around 505 pm edt. Other locations impacted by this severe thunderstorm include hollowville, fraleighs, new forge, elizaville, east taghkanic, mount ross, upper red hook, martindale, germantown and pachin mills. 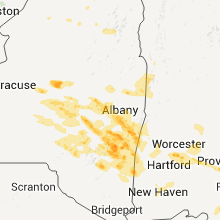 6/12/2015 10:25 PM EDT At 1024 pm edt, severe thunderstorms were located along a line extending from near pittsfield to near great barrington to near copake to near red hook, moving east at 30 mph (radar indicated). Hazards include 60 mph wind gusts and penny size hail. Expect damage to roofs. siding and trees. 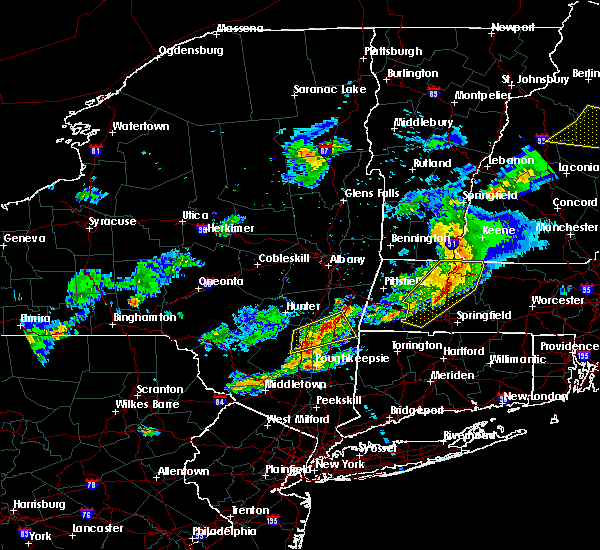 these severe storms will be near, great barrington, lee, hancock and housatonic around 1030 pm edt. lenox around 1035 pm edt. pittsfield and sheffield around 1040 pm edt. 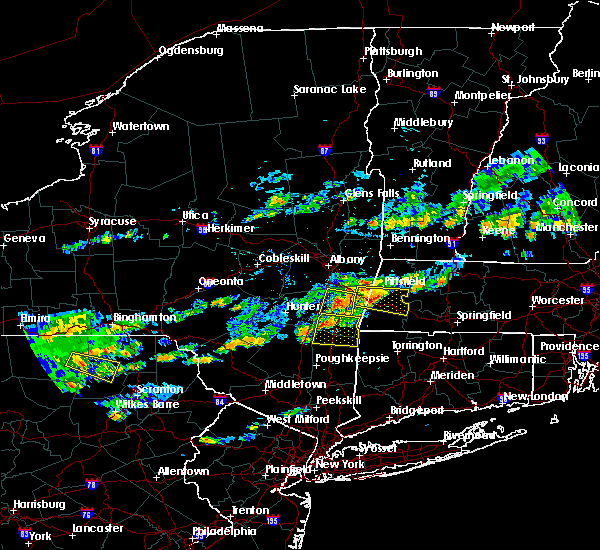 pine plains, otis, ancram, canaan, sandisfield, tolland, ashley falls and east windsor around 1045 pm edt. other locations impacted by these severe thunderstorms include konkapot, elizaville, lenox house country shops, berkshire heights, lanesborough, copake falls, east hillsdale, mount ross, east otis and south sandisfield. 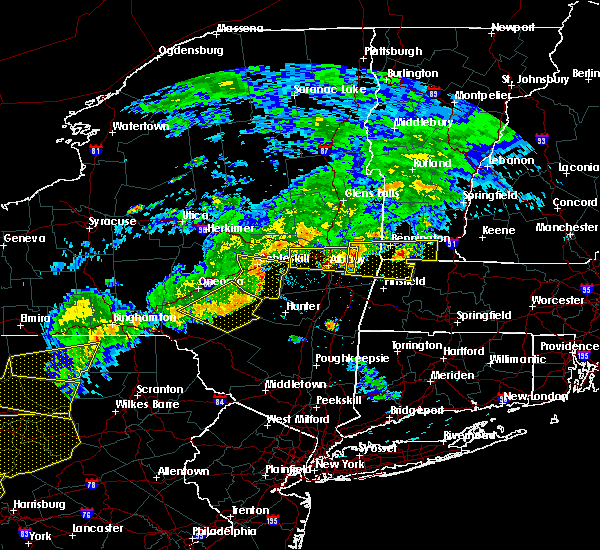 A tornado watch remains in effect until 1100 pm edt for western massachusetts and east central new york. 6/12/2015 9:50 PM EDT At 949 pm edt, severe thunderstorms were located along a line extending from near nassau to near chatham to near claverack to near kenneth l wilson campground, moving east at 30 mph (radar indicated). Hazards include 60 mph wind gusts and penny size hail. Expect damage to roofs. siding and trees. 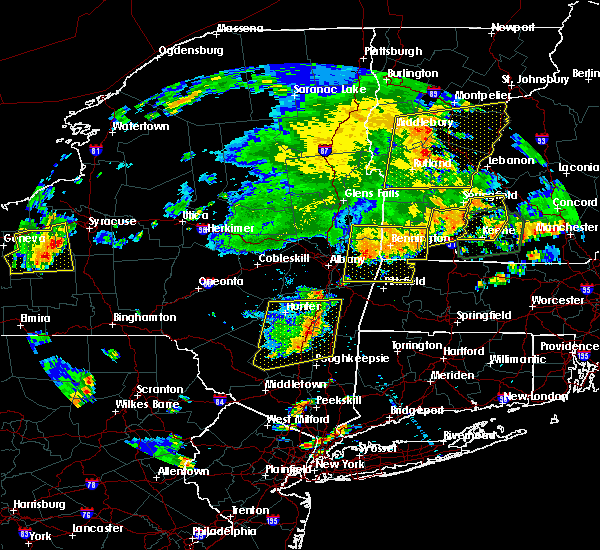 severe thunderstorms will be near, livingston, philmont, averill park and west sand lake around 955 pm edt. austerlitz around 1000 pm edt. stephentown around 1005 pm edt. ancram around 1010 pm edt. 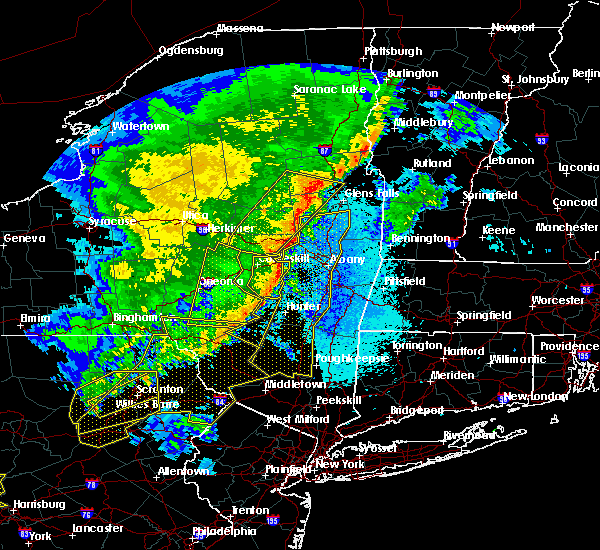 saugerties, new lebanon and housatonic around 1015 pm edt. 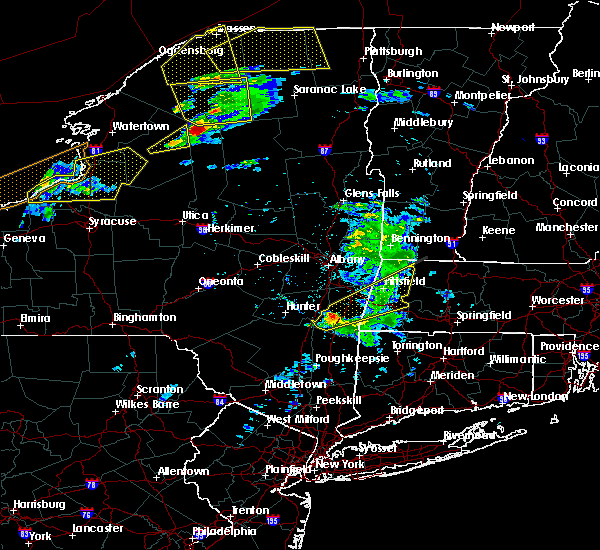 great barrington, copake, hancock and saugerties south around 1020 pm edt. lee around 1025 pm edt. clermont around 1030 pm edt. other locations impacted by these severe thunderstorms include konkapot, east chatham, riders, cheviot, denault corners, elizaville, lenox house country shops, berkshire heights, blue mountain and lanesborough. 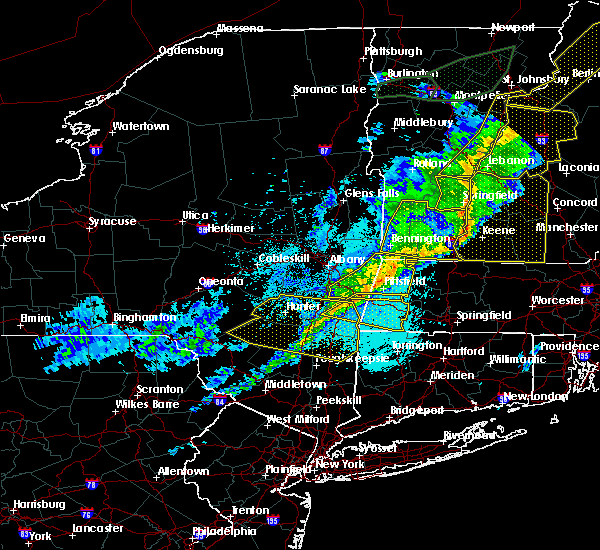 A tornado watch remains in effect until 1100 pm edt for western massachusetts and east central new york. 6/12/2015 9:33 PM EDT At 932 pm edt, severe thunderstorms were located along a line extending from near delmar to near athens to near lanesville, moving east at 45 mph (radar indicated). Hazards include 60 mph wind gusts and penny size hail. Expect damage to roofs. siding and trees. these severe storms will be near, rensselaer, catskill, delmar, ravena, coxsackie, castleton-on-hudson and selkirk around 935 pm edt. east greenbush, hudson, athens, lorenz park and claverack-red mills around 940 pm edt. nassau and claverack around 945 pm edt. 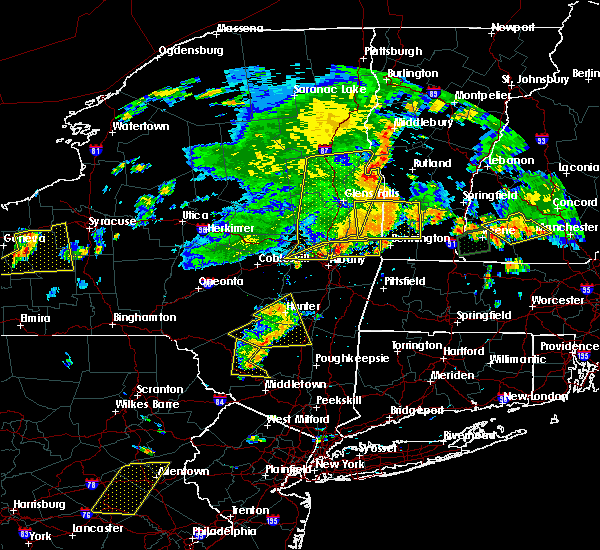 saugerties, chatham and philmont around 950 pm edt. saugerties south around 955 pm edt. livingston and clermont around 1000 pm edt. other locations impacted by these severe thunderstorms include maplecrest, edgewood, east chatham, riders, cheviot, denault corners, lakes mills bridge, braeside, shandaken and blue mountain. A tornado watch remains in effect until 1100 pm edt for east central new york. 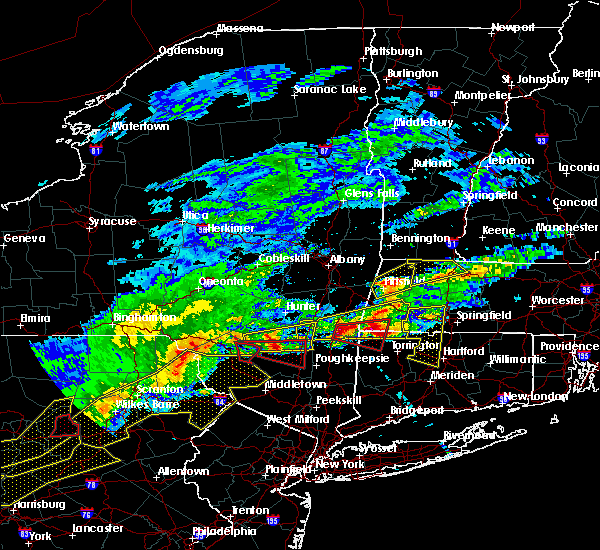 6/12/2015 8:56 PM EDT At 856 pm edt, severe thunderstorms were located along a line extending from schoharie to near gilboa to near arkville, moving east at 40 mph (radar indicated). Hazards include 60 mph wind gusts and penny size hail. Expect damage to roofs. siding and trees. 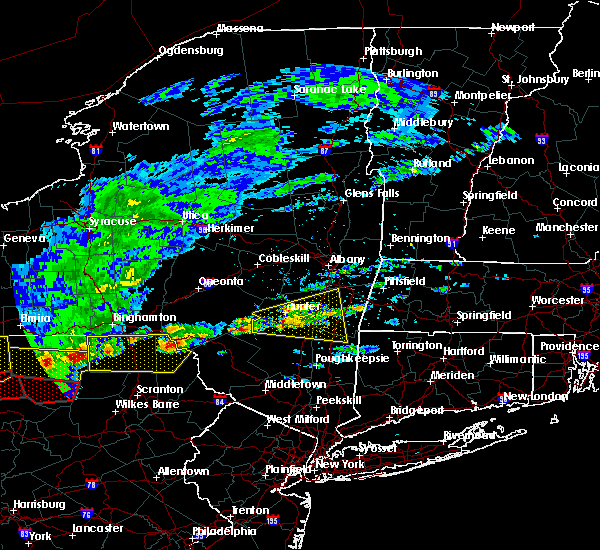 severe thunderstorms will be near, middleburgh around 900 pm edt. berne, windham, preston hollow and preston-potter hollow around 910 pm edt. westerlo around 920 pm edt. voorheesville and lanesville around 925 pm edt. hunter and feura bush around 930 pm edt. delmar, ravena and selkirk around 935 pm edt. rensselaer, woodstock, coxsackie, castleton-on-hudson and north-south lake campground around 940 pm edt. east greenbush, hudson, catskill and athens around 945 pm edt. other locations impacted by these severe thunderstorms include maplecrest, south westerlo, edgewood, cheviot, denault corners, lakes mills bridge, oak hill, shandaken, huntersland and fitchs wharf. A tornado watch remains in effect until 1100 pm edt for east central new york. 5/19/2015 6:17 PM EDT At 615 pm edt, a severe thunderstorm was located over clermont, or 7 miles east of saugerties, moving southeast at 15 mph (radar indicated). Hazards include 60 mph wind gusts and penny size hail. Expect damage to roofs. siding and trees. This severe thunderstorm will remain over mainly rural areas of southeastern greene, northeastern ulster, north central dutchess and southwestern columbia counties, including the following locations, veteran, smith landing, kerleys corners, copake lake, linlithgo, new forge, fraleighs, west taghkanic, germantown and cementon. 5/19/2015 5:39 PM EDT At 538 pm edt, a severe thunderstorm was located over north-south lake campground, or 7 miles northwest of saugerties, moving southeast at 25 mph (radar indicated). Hazards include 60 mph wind gusts and penny size hail. Expect damage to roofs. siding and trees. 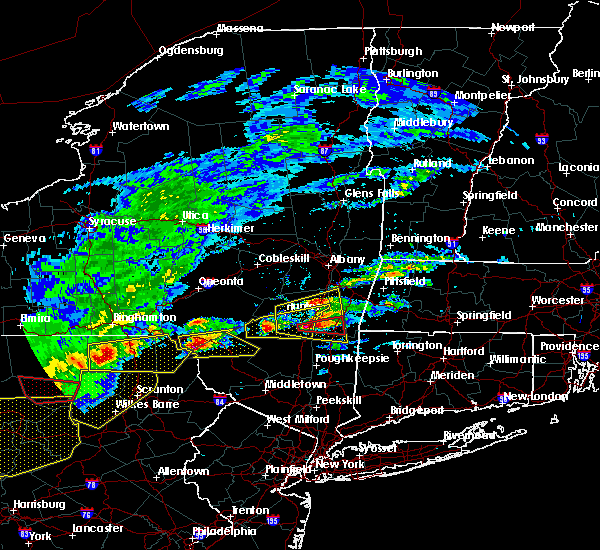 this severe thunderstorm will be near, catskill and saugerties around 550 pm edt. saugerties south around 555 pm edt. livingston, clermont and red hook around 605 pm edt. Other locations impacted by this severe thunderstorm include veteran, smith landing, kerleys corners, copake lake, linlithgo, new forge, fraleighs, west taghkanic, germantown and cementon.